Trees small, palmlike, or shrubs, rarely vines, often prickly, monoecious, dioecious, andromonoecious, gynomonoecious, or polygamomonoecious. Stem stout, unbranched, rarely branched, with a terminal cluster of leaves, with flowing, latexlike exudate. Leaves alternate, long petiolate, usually estipulate, large; stipules when present, spiny; leaf blade palmate or palmatifid, rarely entire or pinnatifid. Inflorescences axillary; male flowers aggregated in cymose panicles; female flowers usually solitary or aggregated in corymbose cymes, large. Calyx 5-lobed; lobes small, connate basally. Corolla 5-lobed; tube long in male flowers, short in female flowers. Stamens 5 or 10, 1- or 2-whorled, inserted in throat of corolla tube; filaments free, connate basally; anthers introrse, tetrasporangiate, dehiscing via longitudinal slits. Gynoecium in male flowers vestigial, or absent; in female flowers syncarpous, synovarious to synstylovarious; ovary superior, 1- or 5-loculed, placentation when 1-loculed parietal (placentas ± deeply intruded) or laminar-dispersed, when 5-loculed axile; ovules numerous, anatropous, bitegmic; styles 1 or 5, free to partly joined, apical; stigmas 5, papillate, dry. Fruit large, fleshy, indehiscent berry. Seeds numerous, surrounded by mucilage; endosperm oily; embryo well differentiated; cotyledons 2, broad, flat. n = 9. Chen Peishan. 1999. Caricaceae. In: Ku Tsuechih, ed., Fl. Reipubl. Popularis Sin. 52(1): 121-122. 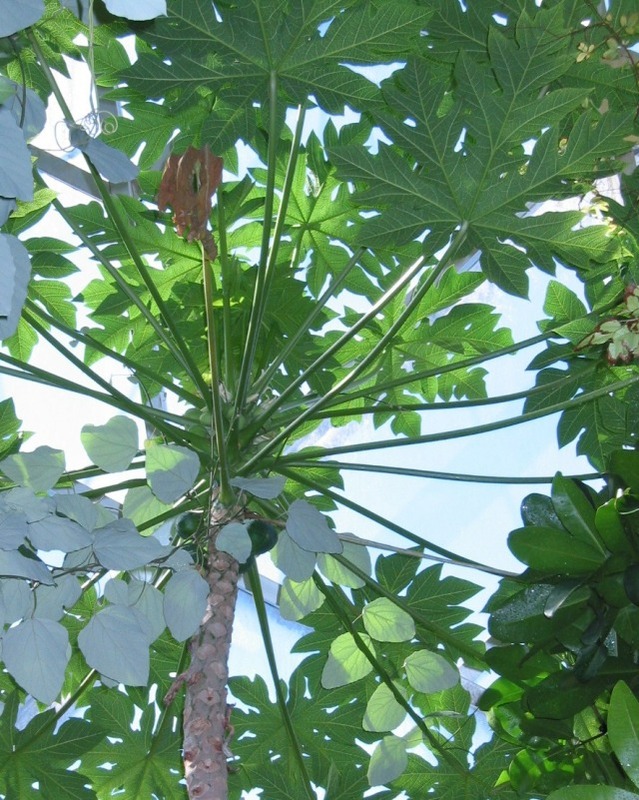 Six genera and 34 species: Central and South America, one genus of two species (Cylicomorpha Urban) in tropical Africa, one genus (Carica) widely introduced and cultivated in tropical areas of the world, including China.